Yesterday it rained all day, then it snowed all night and continues to do so. It is officially Wicked Windy again and it is offically winter. I think this qualifies as my first blizzard, and I don't mean the Dairy Queen kind. Speaking of Dairy Queen, it closed for the winter about two weeks ago. What's that about? 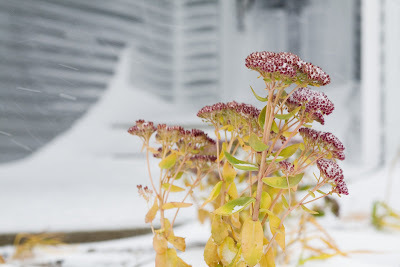 Sedum 'Autumn Joy'....still one of my favorites. I have a few tucked in with some greanery on my kitchen table right now. How wonderful it is to be able to go and pick a few in the beginning of November, but also have them be fabulous the rest of the year as well. I did a few arrangements around the house for my sisters wedding in August and the sedums (wonderfully green at the time) and purple hydrangas were my base. 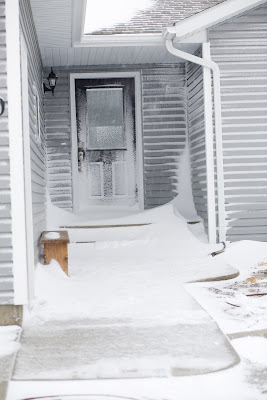 The snow plastered on the door does give the full blizzard effect. It is just (very) wet here. you'll probably not like me if I tell you it's 55 degrees here. But it IS dripping wet everywhere- no pretty white stuff here! What?? How could DQ close for the winter? That's like not eating all winter long! I know, Miriam. That's why ND's motto is "the cold keeps the riff-raff out." It's not because of the cold, it's because DQ is only open 6 months out of the year. LAME-O!!!! I just had a blizzard. Delicious heath bar blizzard. Sorry! "...cold keeps the riff-raff out.." Wow. That explains so much about this beloved city. Now I get it! ...also that there was a movie titled "Leaving Las Vegas." I bet it's also nicknamed "the skinny town" because all the fat people have to leave town or they'll starve!